Walking on people to get to the top doesn’t bother Amanda Winfield, the owner of a successful executive search and headhunting firm in Baltimore, Maryland. But unlike her prosperous career, Amanda’s arrogance has left her personal life friendless and isolated. 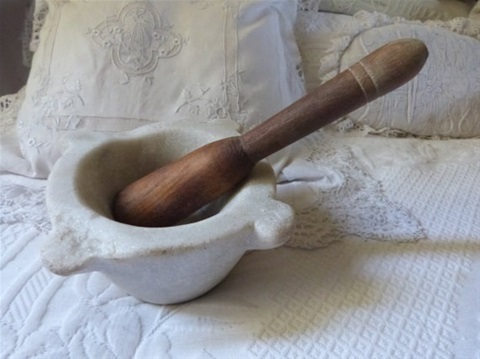 While killing time antiquing, Amanda picks up a pestle & mortar and finds herself transported telepathically, in a split second of reality, back to a time when the tools are being used. The need for the crushed morphine in the frantic scene is riveting and Amanda’s return to reality, after dropping the pestle & mortar, results in a state of near shock. Plagued by the memory of the scene and the insanity she fears it represents, Amanda battles insomnia and struggles to stay connected at work. She is drawn back to the shop to see if the episode was a single aberration. Finding what she believes might portray a simple story, she touches an old wooden sled. The horrific episode attached to the sled sends Amanda into a tailspin that threatens to destroy everything she's worked to build. Desperate for help, Amanda calls her old college roommate, Baltimore Sun reporter, Grace Poole. For years, Grace has avoided Amanda, but she hears the distress in her voice and agrees to meet. In the meantime, Amanda's embittered Office Manager, Donna Williams, takes advantage of her absence and her weakened mental state and begins the process of taking over the company. Intrigued by the outlandish story, Grace agrees to go to the antique shop to prove the episodes are a product of Amanda's imagination. When she hands Amanda a book and watches her experience the phenomenon, she's convinced of the validity of the episodes. The reporter in Grace is hooked and she supports Amanda as the two women work to figure out the meaning of the bizarre occurrences. The pain of the stories behind the antiques continues to unravel Amanda's life and she turns to alcohol, causing her to relive some painful memories of her own. Convinced she needs to stop the episodes, she heads to the shop for one final experience. A crowded dealer’s reception for an exotic set of china keeps her from the mission. The beauty of the set and the desire to touch a piece of the china feeds her obsession. Afraid to handle the dishes anywhere but her own home, Amanda spends days of anxious bidding and ultimately pays $20,000.00 for the set. Alone in her apartment, she opens the box of dishes and pulls out a teacup. The surprising story behind this last episode sends Amanda's emotions to the brink. Desperate, she reaches out to Grace and the cathartic climax exposes the beast that has shaped Amanda Winfield, as a dark family secret, long kept to herself, is revealed. Finally able to face the pain of her past, Amanda is inspired to reach out to the present-day family depicted in the final episode. The process of helping the family heals her broken spirit and gives her the tools to restore her life. This mystical drama about profound transformation attests, from time to time, miracles really do happen.